A Daily Dose of Fit: WIN THIS: A loose leaf tea mug from Libre! I don't drink enough tea. There, I said it. I love the stuff, but I get so impatient with it. Ya gotta let it steep, ya gotta deal with the tea leaves...eh. This, however, is something I need to get over because tea is good, it's good for me, and let's be honest—it doesn't take that much longer to prepare than my instant coffee. I learned this lesson last March when Libre Tea sent me a loose leaf tea glass to review. And then I learned that same lesson again this weekend when I used my new loose leaf tea mug. Yep, a mug. It's the newest addition to the Libre Tea family, and the kind people behind it sent me one to review. Gotta say, I love the addition of the handle. The original was great, but the mug version is better. Hot beverages are better in mugs, are they not? It's unexplainable, really. But true, nonetheless. Also true, "the state of being free:"
Why, yes...yes, I will take a "tea moment." In fact, I've been prepared for just such a moment after a shopping trip in South Bend left me at the Teavana checkout counter. Do you have Teavana in your area? 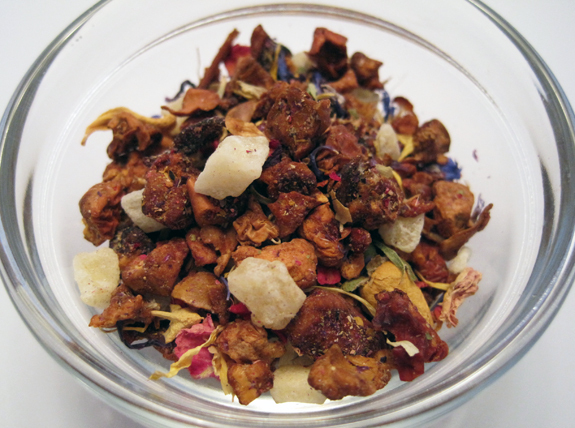 It's a divine little loose leaf tea shop with types of teas for just about any taste buds. I bought Pineapple Kona Pop. It's an herbal (and decaf) tea that takes me back to every vacation I ever took to the Hawaiian islands. Subtle and sweet, delicious in every way. And seriously, it smells so good. Once you steep the tea according to your specific tea's instructions, you'll have a warm beverage ready to go wherever you do. That's the beauty of the Libre Tea mug. It's a tea infuser for on-the-go tea moments. Can't beat that! I encourage you to visit Libre Tea and check out their selection of loose leaf tea glasses. Consider them a Daily Dose recommendation for the tea lovin' fitness fanatic in your life! 1) Like Libre Tea on Facebook. 2) Follow Libre Tea on Twitter. 4) Like Daily Dose on Facebook. 5) Subscribe to Daily Dose. Be sure to leave individual comments so that I know how many entries to give you! Contest ends at midnight, EST on Friday, November 9, 2011. G'luck! I like to have my decaf tea after the kids go to bed watching one of my favorite tv shows! 3) Sign up for the Libre Tea newsletter. 4) Liked Daily Dose on Facebook. My favorite moment is after dinner when I settle into the evening with a warm cup of tea. It calms me and keeps me warm during the winter months. I liked Libre Tea on FB! I liked Daily Dose of Fit on FB! I liked Libre on FB. I already like DDOF on FB. Tea is the best at night when I need to chill out and wind down for bed. My favorite tea moment is curled up by a fire with a good book and nice hot cup of tea. I like Libre tea on FB. Amazing loose leafe tea sounds delicious !! In the morning before anyone else is awake. My ideal tea moment is a hot cup of tea with a good book on a cold snowy day! I like having tea with a girlfriend the best, we make it an "occasion". I LOVE the Libre Tea Poly n Glass series of products. Currently liking them on Facebook and subcribed to their newsletter. I love having tea while wrapped in bed watching TV with my husband. My ideal tea moment is first thing in the morning instead of coffee. I would love to switch over. Sitting on the couch watching my babies play sipping on some chai tea - that would be nice. liked Daily Dose on facebook. Keep up the great posts!! I love having tea at work - just taking a moment to step back from the chaos and relax, even if it's only long enough to for a cup of tea! My favorite tea moments are definitely those involving a good book and my pets all cozied up with me! my favorite times to drink tea is after a long day of work. My tea moment is when I'm cold and need something warm!